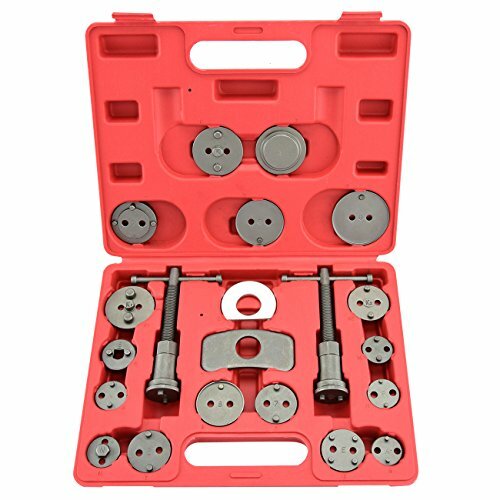 Voluker disc brake tool is designed for brake assemblies. It rotates piston back into caliper for fitment of new brake shoes. Our item is universal and can be used on most models including Europe and Japan models such as Mercedes, BMW, VW, GM, Audi, Ford, Honda, Subaru, Mazda, Nissan, Mitsubishi, Toyota, Rover, Opel And so on. ♂-- 17 Sizes Of Punches To Choose. Mutil-Functional :Includes tools & 17 adapters for both right & left-handed applications,Use on front or rear disc brakes. If you have any questions about this product by Voluker, contact us by completing and submitting the form below. If you are looking for a specif part number, please include it with your message.